An Asian bird decided to take a more luxurious form of transport to London last week. An Asian bird joined business class passengers on a flight to London from Singapore last week. The bird was discovered 12 hours into the 14 hour flight in the Business Class cabin of the plane. It's currently unknown as to how the bird was able to hide for 12 hours in the plane. 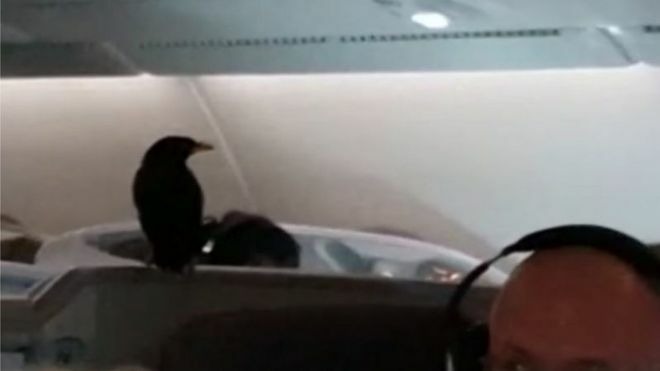 In a video shared online, the bird seemed to make itself comfy on a passenger's seat before relaxing on a seat headrest. A flight attendant then attempted to grab the bird however it flew away, most likely to find a better seat in First Class. The bird was eventually captured with the help of some nearby passengers and was placed into quarantine at Heathrow Airport in London. Viewers were quick to notice that the passenger was a Mynah Bird, which is native to southern Asia. Social media users were quick to joke about the bird's choice of travel. It seems even he knows to avoid Economy!